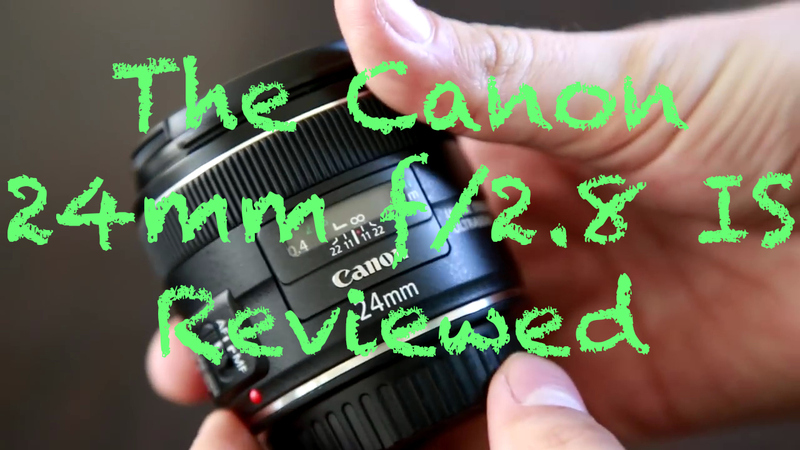 If you’re considering a wide prime lens purchase, or moving away from the 24-70mm work horse and swapping it out for a range of primes then perhaps a good starting point is the Canon 24mm IS. Admittedly, if you’re swapping the 24-70mm zoom for primes you’ll propably want to include a 50mm and an 85mm, however these lenses do not come with image stabilisation which make the Canon 24mm IS a unique starting point. We know it can scary prospect moving over to purely use prime lenses but they do come with their distinct advantage such as faster apertures, added sharpness and something we may have mentioned already, oh yes – Image Stabilisation! Welcome to the Canon EF 24mm f/2.8 IS USM. The lens is small, compact and fits neatly into a pocket for easy access. This lens is designed to work on both full frame and APS-C cameras, and it costs around £460, which is a little expensive for this kind of lens so we’re going to explore if this lens is really worth the investment in our video review . A very welcome feature on this lens is image stabilisation which will keep your video footage looking very steady, and it will really help you to get sharper pictures in darker conditions, too. The build quality is good feeling quite solid, it is well-made and manages to be quite small and light, looking a little stubby – it’s a very easy lens to keep on your camera on an all day shoot. This lens, as we see it only two weaknesses. Firstly, it suffers from somewhat strong vignetting levels, although the peripheral illumination in your camera can take care of that. Secondly, it’s rather overpriced for an f/2.8 lens; so even with all its optical strengths, it’s not particularly great value for money. But value for money is in the eye of the beholder. Anyone who wants a small, fun, image stabilized lens which is optically excellent, will be very happy with Canon’s 24mm f/2.8 IS USM lens. So from that point of view, it certainly comes recommended.